Showing 9 articles from May 25, 2014. In response to some discussion online about the possible shut-down of the Dr. O.R. Nevitt Memorial Swimming Pool, two dozen community members attended the monthly pool meeting last Thursday to assess the situation and offer assistance. The board members of the pool commented that it was the largest meeting of their memories. Photo by Kayla Camenzind Two cranes shifted the bridge to southern bank of the river last Thursday, May 22. 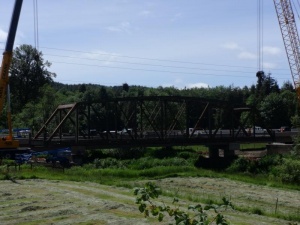 MENLO - The Willapa Bridge on SR 6 was dismantled last week by construction workers who are putting in a new bridge to replace the 1929 structure. Madison Huber (middle left) posed with the other Hereford royalty after becoming Washington State Jr. Hereford Princess. 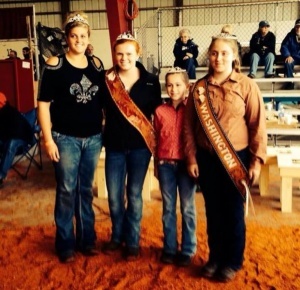 Madison Huber of Lebam became the Washington State Jr. Hereford Princess earlier this month. $177,282.27, approved via their consent agenda. SOUTH BEND - Raymond Police Chief Chuck Spoor and South Bend Police Chief Dave Eastham announced that they are endorsing Mark McClain for Pacific County Prosecutor in the upcoming primary and general elections later this year. There are but a handful of contested races in this year's elections. Raymond High School senior Antonio Ayala Mendoza organized the third annual Night of the Arts at RHS on May 21. 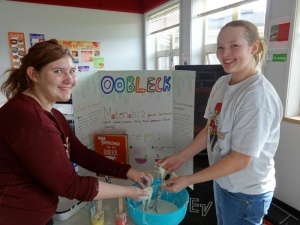 Dozens of students participated by demonstrating their hands-on science experiments, presenting their artwork, and playing their instruments in the band concert. At the WSU Master Gardeners Show at the Grays Harbor County fairgrounds on May 17, Cindy Knight of Cindy’s Plant Stand in Elma gave the Herald tips about how to successfully grow tomatoes. Knight is a Washington State Certified Nurseryman since 1971 and is the longest Master Gardener in Grays Harbor County.